Dusit International, one of Thailand’s leading hotel and property development companies, has partnered with Silpakorn University to launch a unique project to preserve the rich architectural and artistic heritage of the company’s iconic flagship hotel, Dusit Thani Bangkok, which will be redeveloped next year as part of a landmark mixed-use development. 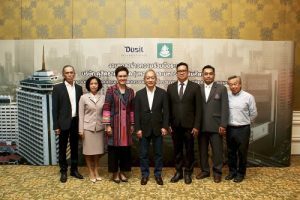 Officially titled ‘Preserving Dusit Thani Bangkok’s Artistic Heritage,’ the project will see preservation experts from Silpakorn University carefully identify, document, dismantle and preserve key items of historical or artistic value in the property for use in the new version of the hotel, which is slated to open in 2023. Data and photographs of the project will also be presented in a digital book for those who wish to learn more about the original building. Opened in 1970, Dusit Thani Bangkok is an early exemplar of contemporary Thai architecture which distinctively blends western modernism with traditional Thai design. Inspired by the great pagoda of Wat Arun (Temple of Dawn), the unique structure has long drawn the attention of architecture students impressed by its convention-defying form, which heralded a new era of development in Bangkok. The hotel’s interior is also lauded for its rich artistic heritage. The Thai motifs and murals that adorn the columns and walls of the hotel’s signature Thai restaurant, Benjarong, for example, were hand-painted by Paiboon Suwannakudt, famously known as Tan Kudt, a neo-traditional Thai painter who was a key figure in the modern reinvigoration of Thai mural painting. 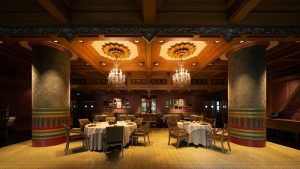 His intricate paintings and murals will be carefully preserved for use in the new Dusit Thani Bangkok. Benjarong’s carved timber ceiling will also be carefully dismantled for use in the new hotel. Silpakorn’s experts will also study the hotel’s distinctive landscaping, particularly the renowned waterfall garden, which provides a serene and leafy escape in the heart of the city. Prize trees will be documented and preserved as much as possible. 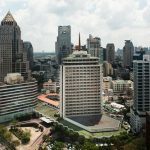 Dusit Thani Bangkok will hold its last full day of operations in its current form on 5 January 2019.